RHJ has the best overall tools of any wing in the draft, as he boasts elite athleticism with a 7’2″ wingspan and elite frame. As expected, he badly struggled offensively in SL and pre-season as he’s nowhere near an NBA 3 point threat and doesn’t have the handle to do much off the dribble. After shooting 5/21 from 3 in summer league, he didn’t attempt a single 3 in 85 pre-season minutes, which is a bad sign. His strengths stood out as much as his weaknesses though: he racked up loads of steals, blocks, and rebounds while posting slightly more assists (27) than turnovers (25) in the combined summer league and pre-season sample. He’s such an elite and versatile defensive player he has awesome upside if he somehow develops a 3 point shot. As it is, he looks like he will be an MKG type with less inside the arc scoring. He has a long way to go to fit in offensively, and Brooklyn is not the sharpest team to put him in a position to succeed on that end. His tools and defense are so outlier good I remain fond of him. Any level of passable offense can make him a highly useful NBA player. Booker is a weird player to evaluate. He’s one of the youngest players in the draft and could become one of the most accurate shooters in NBA history. But he has not gotten off a huge volume of 3PA in college, SL, or pre-season. He has short arms and his trigger isn’t the fastest, so his volume of 3PA may always be light. The most interesting comparison for Booker is Arron Afflalo, as they share similar surprisingly low output in 3PA rate, rebounds, steals, and blocks. Booker is a superior draft prospect to Afflalo, and a rich man’s Afflalo is obviously a useful player. It’s just not teeming with upside, and Booker needs to find his calling card to exceed that. Booker has a surprisingly decent handle, moves reasonably well, and is super young (doesn’t turn 19 until Oct 30) so he has potential to develop a much more diverse and efficient offensive repertoire than Afflalo. Phoenix’s hope is that if he works diligently, he has a sliver of equity to become a Ray Allen or Reggie Miller type down the road. It seems like a long shot since he is currently so far away, but it cannot be completely ruled out since time is on Booker’s side. Frank the Tank had a disappointing pre-season, converting just 34% of his 2PA (13/38). This follows a decent but unspectacular 46% (21/46) in summer league. His most common comparison of Kelly Olynyk dominated both samples shooting 67% in SL (34/51) and 57% PS (28/49) as a rookie. These small samples do not mean that Kaminsky cannot be as good or better than Olynyk, but it dims his upside as he should be held to a higher standard than his younger, rawer, and more athletic peers. Dekker struggled to make outside shots in his 148 pre-season minutes, but otherwise performed decently. He should be a nice fit in Houston, as he can play both SF/PF and pairs well with both Howard and Capela as a stretch 4. Also, being surrounded by shooters should help his slashing game as he has the athleticism to get to the rim and the size to finish. Dekker’s parallels to Chandler Parsons are hard to ignore, as they have similar size and college shooting %’s (Dekker: 59%/35%/70% two/three/FT vs Parsons 58%/34%/61%). The key advantage for Parsons is his PG skills, as he had more advanced handles and a much higher NCAA assist rate. But Dekker is a bit more athletic, and if he develops into a reliable NBA 3 point shooter like Parsons he could become a decent offensive weapon in his own rite. Lyles showed some positive signs pre-season (14/29 2PA and 6 AST vs. 4 TOV), but he struggled in his larger summer league sample and was dragged down by his inability to make 3’s in both samples. After shooting 4/29 from 3 in college, he made just 6/27 in pre-season and summer league and needs significant improvement to justify his lottery selection. In the instance that Lyles does become an adequate 3 point shooter, he’s an interesting piece. He has a nice first step and handle, and a stretch 4 who can also slash from the perimeter is an intriguing piece. But since he’s not that explosive, he often pulls up for floaters when his drives get cut short. He has good offensive upside, but he still needs a fair amount of polish on that end for a player who will likely be a defensive liability. In the high skill low tools PG category, I could never reconcile how Payne’s stock rose so much higher than Jones. Jones was the #4 RSCI recruit, he won MOP of the final 4, and almost every stat model rated him higher than Payne. Yet Payne went 14th to a team that normally drafts well, and Jones was passed on by a number of good GM’s as he slid all the way to 24th. Payne has slightly better physical tools with 2 inches great length and superior quickness, but he still doesn’t have the body or burst of a prototypical NBA PG. I believe Payne vaulted ahead of Jones simply because he stylistically looks more impressive. He has a better handle and has more shake to overcome his lack of burst. He can also make a number of difficult shots of the dribble from pull-ups between pull ups, stepbacks, and floaters. Payne also plays with a swagger that is intoxicating to watch when he is running well. In contrast, Jones is more of a steady hand guiding an offense that surrounded him with elite talent. Stylistically he was much more boring, as he thrived off of avoiding mistakes and making open shots. On one hand, Payne has a bit more meat in his game to build around as a primary ball handler, so his advanced standing may be justified. On the other hand, Jones is 1 year 9 months younger and has time to catch up, and it is possible that Payne earned more attention simply because he has a fun factor to his game that will not translate into NBA success. I am not sure which side of the argument is truer, and neither player received enough playing time in pre-season to shed much light on the subject. This comparison will be interesting to re-visit in a few years. After a terrific summer league, Anderson had a horrid pre-season on the Mavericks’ depleted roster. With a lack of shot creation on the team, Anderson struggled to make 3’s (4/25) and had a poor assist to turnover ratio of 7 to 16. He gets a bit of a pass because the entire team struggled, and he does fit the 3 + D archetype rather well. He isn’t the defensive beast that Rondae Hollis-Jefferson is, but he nevertheless has good D potential and is a much easier fit into NBA offenses with his superior shooting. His injury means no instant gratification but rookies are terrible anyway. He should be worth the wait for the value he provides at 30th overall. His main concern is that his lack of explosiveness and ball handling prevent him from living up to his statistical adoration. Hunter struggled to score in pre-season, but other than that he crushed the eye test. He has a great passing ability, and played good defense for a rookie showing solid fundamentals and using his length to create a whopping 11 steals in 132 pre-season minutes. He racked up impressive steal and block totals playing in Georgia Stat’s zone defense, and it’s encouraging that he has transitioned nicely to man to man at a higher level. Hunter should have a career in the NBA as a prototypical 3 + D wing, and could end up finding rotation minutes as a rookie for the Celtics. Mickey has been one of the biggest surprises of the pre-season, leading all rookies in PER. Granted, his 68 minutes largely came against garbage units of the Knicks, 76ers, Nets, and foreign teams, but he looked good and earned praise from Brad Stevens. Mickey is one of the funkier prospects in the draft– he has excellent quickness, athleticism, and length, and is a good shot blocker. He is extremely versatile and has loads of defensive upside in a scheme that switches heavily. His problem is that at 6’8″ he lacks height to play center, and he lacks the passing ability and shooting range to play PF. He didn’t show much promise in these areas with 6 assists and 1 3PA in 293 combined minutes between summer league and pre-season. But he did show potential as a pick and roll finisher with surprisingly smooth footwork and finishing, and he also has a respectable mid-range shot. Consequently he scored with better volume and efficiency than expected in both summer league and pre-season. Given trends toward smaller lineups and heavy switching, perhaps he can be a great defensive center in spite of his height. His other tools help compensate, and there aren’t many centers who can really punish shorter matchups. His lack of passing and range inhibit his offensive upside and ability to fit in a wide range of lineups, but his strengths are unique and strong enough to overcome his warts. Pair him with a PF like Kelly Olynyk and give him a coach like Brad Stevens and his impact could be surprisingly good. I didn’t think much of him before the draft, but he is quickly winning me over as a second round steal. As the oldest players drafted in round 1, these players have more pressure to contribute immediately to maintain their value as prospects. Grant was mediocre and Wright was bad, playing a meager 72 minutes while posting more turnovers (8) than assists (7) or 2 pointers made (7). I liked both pre-draft, but with so many younger players outperforming them they get ticked down a few slots. 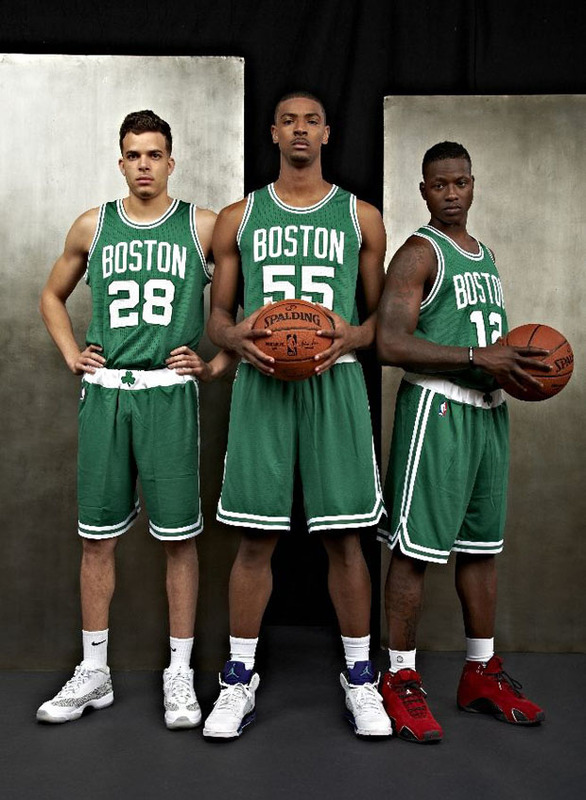 Rozier is an undersized SG who atones with good length and athleticism to be a pesky defender at both guard positions. He doesn’t have much in the way of PG skills, but he has been more than competent making 3’s at 46% (18/39) between SL and PS. In other words, he’s roughly an Avery Bradley doppelgänger which makes him a puzzling selection at 16th overall. Danny Ainge gambled on him working hard enough to leverage his great first step into shades of a real slashing game, giving him theoretically high upside. His first step enables him to get past his man, but he doesn’t have the handle or shake to consistently get past the help defense and he often pulls up for mid-range shots when his drive gets cut short. Incidentally his efficiency suffers, as he shot just 33% inside the arc in SL (19/58) and 43% in a smaller pre-season sample (9/21). This sets him behind Avery Bradley, as he may match Bradley’s mid-range volume at a much lower efficiency. A less efficient Bradley is not a useful player, so Rozier needs to drastically reduce his pull-up attempts and increase his layups to become a more useful player. In theory this is possible, but he looks very unnatural navigating through the teeth of a defense for a 21 year old. It’s hard to envision a good work ethic being enough to turn this weakness into a strength. I can see Rozier having a decent career in the league, but I just don’t see the upside to merit a 16th overall selection. I rated Norman Powell as one of my top 2nd round sleepers before the draft, and he justified that rating with a great summer league and pre-season. He is a freak athlete with long arms who can get to the rim and play defense. If he ever develops an NBA 3 point shot he’ll be a big time steal. I still haven’t seen him play, but the Spurs drafted him– how bad could he be? I’m one of the few people who had him as acceptable value in the late first round, and this is why. I pegged Richardson as a 2nd round sleeper based on his defense, and he was a steal and blocks machine in SL/PS. He’s not much of a scorer, but he moves the ball and if he learns to make NBA 3’s he will have a career as a rotation player. This guy hasn’t played in forever bc of a torn ACL but he was a 5 star recruit who got loads of stocks as a freshman so let’s not forget him. The Good: He is super young and can get buckets. The Bad: He doesn’t do anything else. In 139 pre-season minutes tallied just 9 rebs, 6 assists, 0 steals, and 0 blocks. His tools are pedestrian with a 6’7″ wingspan and not great athleticism, so it’s hard to get too excited about his one dimensional scoring. Martin missed the entire pre-season with a broken foot. He didn’t seem like a great value at 25th overall to begin with, so it’s hard to feel excited for him. He is athletic and his LSU teammate Jordan Mickey looked better in an NBA system, so maybe Martin translates better than expected too. Harrell was an effective garbage man in SL and pre-season, I’m just not sure how much it matters. He only attempted 1 three in spite of wearing a Houston uniform, and he doesn’t have the defensive aptitude to play center. I don’t see how he he fits next to Howard or Capela, so this was a semi-odd pick to me. I suppose Morey just decided to draft his top player and sort out the details later. Here are some guys to round out the top 40 since 34 is a weird amount of prospects to rank. Christian Wood might make the 76ers’ roster to the delight of draft nerds, as bad interviews caused him to go undrafted in spite of a profile that made him a clear 1st rounder. This past weekend a number of players improved their draft stock, but nobody skyrocketed their value like Frank Kaminsky did. After scoring 19 points against Oregon’s mediocre defense to help Wisconsin advance to the sweet 16, he faced off with Baylor’s twin towers: 6’9 Cory Jefferson and 7’1 Isaiah Austin. Baylor plays a zone defense that is not particularly effective as a whole considering their talent (77th best defense in the country according to kenpom.com). But they do have the 20th highest block rate which posed a prospective challenge for a player like Frank Kaminsky who has questionable tools and is most effective in the paint. After all, Baylor did limit Doug McDermott to just 15 points in a 85-55 shellacking of his Creighton team. Kaminsky had a nearly mistake-free game with 19 points, 4 rebounds, 3 assists, 6 blocks, and 0 turnovers on 8/11 shooting en route to a 69-52 Wisconsin victory. All 8 of his FG’s were made at the rim, and 4 of them came with the 7’1 shot blocker Austin guarding him. The amusing part is that I had mentioned in my podcast with Brew Hoop that Kaminsky was a player I valued above Doug McDermott, and then their results vs. Baylor emphatically supported that claim. Baylor beat Creighton by 30 and lost to Wisconsin by 17. While there is a fair bit of variance involved (for instance: Baylor shot 11/18 from 3 vs Creighton and 2/15 vs Wisky), the different results are indicative of the disparity between Kaminsky and McDermott’s NBA values. Baylor shot just 16/42 from 2 vs Wisconsin and 19/29 vs Creighton. Kaminsky made a clear impact on this end by blocking 6 shots. That exceeds McDermott’s season total of 5 blocks, which is also his career high. Height matters, and Kaminsky being 7’0 to McDermott’s 6’8 makes an enormous difference on both ends. After disposing of Baylor, Kaminsky faced a tougher test vs. Arizona. I had picked Arizona to win it all in my bracket because I am in love with their defense. They simply do not allow easy baskets – they play elite transition defense, they close out on 3 point shooters, and they use their quickness and athleticism to cut off drives to the rim and funnel everything to the mid-range. According to hoop-math.com, 48.8% of their opponents’ shots are non-rim 2 pointers, the best mark in the NCAA. Putting this in perspective, the NCAA average is 29.3% and the second best team, UNC, is forcing teams to take 46.8% of their shots from mid-range. But what is truly amazing about Arizona is that they do not cede high quality looks, as opponents shoot just 32% on these non-rim 2 point attempts whereas UNC opponents hit 40.9% (NCAA average: 35.7%). They are custom built to expose any players who pad their stats vs inferior competition, and provide a matchup nightmare for most good college offenses. In the end, though, the only person who is going to have nightmares from this matchup is Wildcats’ coach Sean Miller. 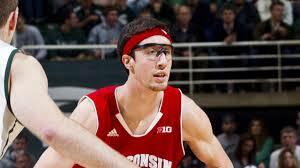 In spite of his facial deficiencies, Frank Kaminsky could not be stopped in Anaheim. 7’0 center Kaleb Tarczewski struggled to guard him out to the perimeter due to Kaminsky’s quickness, and 6’9 Aaron Gordon struggled to bother his interior shot attempts due to Kaminsky’s height. Arizona’s defensive goal of forcing difficult shots could not be achieved against Kaminsky because he can score from anywhere and is tall enough to shoot over all of their players. He finished with 28 points, 11 rebounds, and 1 turnover on 11-20 FG while his teammates were limited to just 34 points on 13-41 FG and 8 turnovers. He singlehandedly put the Badgers in a position to upset Arizona, and in my opinion this was the most impressive individual performance of anybody this NCAA season. His offensive game is reminiscent of Dirk Nowitzki – they are both 7’0 players who can score efficiently from 3, the mid-range, and the low post and are nearly indefensible once they catch the ball. Which is not to say that he will ever be nearly as good as Dirk, but his performance vs. Arizona speaks strongly in favor of his ability to translate to the pros. The primary concerns for Kaminsky’s pro prospects lie on the defensive end, where he does not project to be good. That said, he is not necessarily going to be a sieve either. Much like Michigan, Creighton and Duke, Wisconsin values floor spacing and prefers to play with at least 4 shooters. Incidentally, these are also the top 4 offenses in the country. Wisconsin starts 6’7 Sam Dekker as a small ball PF, and Kaminsky is their only true starting big man with 6’7 Nigel Hayes backing him up. Yet Wisconsin’s defense (97.1 adjusted d-rtg as per kenpom.com) is much more effective than that of Michigan (102.1), Duke (102.3) and Creighton (104.1). They do have the weakest offense of the quartet by 2.5 to 3.8 points, but Kaminsky nevertheless deserves some credit for keeping their defense respectable as the sole rim protector. The Badgers are barely worse defensively than Kentucky (96.6) in spite of Kentucky’s elite size and athleticism. Kaminsky’s monstrous tourney performance has enabled him to finally crack ESPN and DX’s top 100, but they still only rate him 52nd and 48th respectively. It seems certain that their rankings reflect a general bias against his physical appearance. 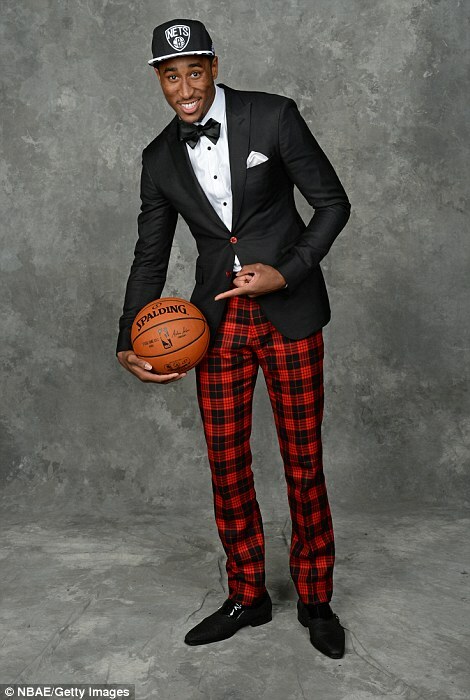 While he may look like an uncoordinated accountant, he is an exceptionally smooth and skilled basketball player. I have him locked in as a 1st round value and believe he may merit late lottery consideration, even in the face of this loaded draft. I have written about his warts as both a horrific shooter and a tweener in the past, but his performance down the stretch and in the tourney has caused me to warm up to him. While his warts remain present and enigmatic, his strengths are so appealing that they may be nevertheless worth stomaching in the top 10. Gordon’s tournament included two excellent performances against top 15 defenses, shooting 8/10 vs Gonzaga and 7/9 vs San Diego State. He struggled vs. Wisconsin shooting just 3/11, but he still managed to tally 18 rebounds, 2 assists, 1 steal, and 2 blocks all while competing hard on defense. He may not have epic steal and block rates, but he deserves a healthy portion of credit for helping Arizona rise from the #47 to #2 kenpom defense. And he even offered a glimmer of hope for his shooting ability, finishing the season 35.6% (16/45) from 3. I will be writing about him in more detail going forward – he is one of the more fascinating prospects in this draft. For all intents and purposes, Hollis-Jefferson is a slightly older and shorter doppelganger of Aaron Gordon. He shares Gordon’s shooting woes on non-rim 2’s (29.0% vs 27.5%), is much better on FT’s (68.2% vs 42.2%), and made fewer 3’s (2/10 vs 16/45). Otherwise their stats are frighteningly similar, and Hollis-Jefferson also deserves some credit for Arizona’s defensive leap. He had a solid tourney showing, playing well in all 4 games and boosting his FT% by shooting 20/23 at the line. Napier turns 23 in July, and a player of his age should dominate 18-21 year old competition if they are going to become a quality pro. In the tournament Napier has done precisely that, racking up 93 points on 63.9% TS vs. four top 75 defenses. UConn’s strength has been in their half-court defense, as on offense they do not seem exceptionally well coached. They have plenty of shooting surrounding Napier, but their half-court offense seems to entail standing around and hoping Napier figures something out. Thus far it has worked for them. I am still not sure that Napier merits 1st round consideration, but if nothing else he is piecing together a reasonable argument in his favor. Harris largely vanished vs. Virginia’s exceptional transition defense, finishing with just 6 points and 3 assists on 2/5 FG in 29 minutes. He redeemed himself vs UConn with 22 points on 8/14 shooting, but he scored largely off of jumpshots which mostly came in transition. While I still have him as a mid-1st round pick, his tourney performance casts doubt on his potential as a half-court slasher in the NBA. Payne is a 23 year old 6’11 man, and while he dealt with injuries throughout the season he was finally healthy for the tournament. This was his opportunity to crush the younger competition he faced in the same way that Napier did, and he came up underwhelming. He had his best performance vs 15 point underdog Delaware, scoring 41 points highlighted by his 17/17 FT shooting. But then in the real matchups, he never shined. 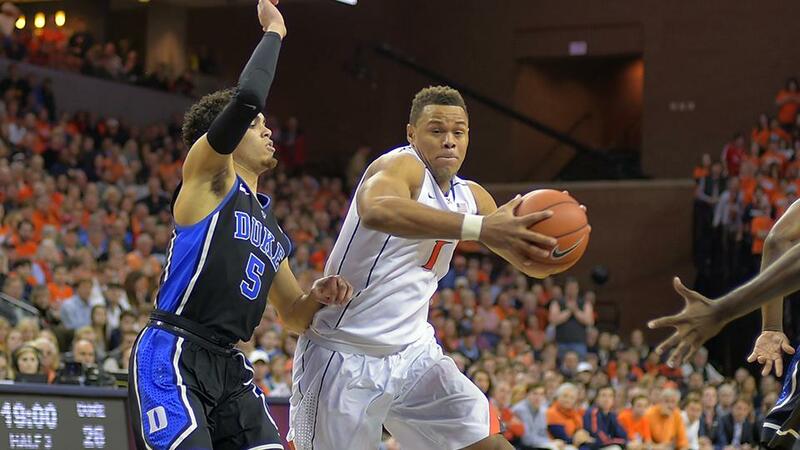 Against Harvard, Virginia, and UConn he finished with just 41 total points on 13/36 shooting. While he offers some prospective value as a role-playing stretch 4, it’s hard to get excited about a player of his age that isn’t flat out dominating the opposition. I do not believe he belongs in round 1. Dekker has been rated as the consensus top prospect on Wisconsin all season long, but this acclaim now appears to be unjustified since he has been badly outshined by his teammate Frank Kaminsky. He scored just 7 points in each of his games vs. Arizona and Baylor, and that includes a banked in 3 pointer vs. Arizona. Perhaps he merely happened to go cold at the wrong time, but it would be encouraging if he could step it up with a strong Final 4 performance or two. Now that the Wildcats have finally pulled themselves together and vanquished 3 top 10 teams that all made last year’s Final 4, it seems inevitable that somebody must have improved their stock. Their most consistent performer has been Aaron Harrison, who has averaged 16.6 points in his past 7 games scoring at least 12 in every game. This largely stems from him hitting 22/44 3 point shots, including the game winners vs. both Louisville and Michigan. His 3p% has jumped from 30.6% to 35.7% during this stretch, but the other aspects of his game have not followed suit. He is averaging just 1.4 rebounds, 1.1 assists, and shooting 14/35 inside the arc in those same 7 games. His taking and making more 3’s has helped the team immensely, but I had already assumed he was suffering from bad variance on 3’s so this does not significantly alter my perception of him as a prospect. Julius Randle has been steadily inching back up my board, as he seems to have cut down on his turnover issues by posting up less frequently. He has posted a double-double in every tournament game averaging 15.8 points, 12.0 rebounds, and just 2.0 turnovers. This sample includes solid games vs top 11 defenses Louisville and Wichita State, but he also drew favorable matchups in Michigan and Kansas State as their lack of size and shotblocking is directly in his wheelhouse. He has made the greatest genuine improvement of all Kentucky players, and has boosted his draft stock in my eyes more than any of his teammates. I stand by my central critiques of his game, but he will likely end up in the top 20 of my final big board. Marcus Lee might be the player who helps his stock more than anybody if he turns in a strong Final 4 showing with Willie Cauley-Stein doubtful to play. He made a huge impact vs. Michigan, finishing with 10 points, 8 rebounds, and 2 blocks in 15 minutes largely stemming from his 4 putback dunks. This should be taken with a grain of salt against Michigan’s undersized defense, but Kentucky would not have won without Lee’s effort. If he builds on this opportunity, he could bolt for the NBA instead of staying another season at Kentucky battling for minutes in a crowded frontcourt. Dakari Johnson had a big game vs. Louisville but has otherwise been quiet. James Young has been alternating between good and bad games. While Andrew Harrison had a decent game vs. Louisville, his 20 point game vs. Wichita State included 6 turnovers and he was nothing short of atrocious vs. Kansas State and Michigan. He has improved, but I still do not believe he is going to become a useful NBA player and would not draft him.